I decided to go ahead and make myself a Christmassy December Journal anyway, even though it was half through December and I really didn’t have the time to do it. Sometimes when there is no time you just have to ignore that and do your thing anyway. Especially if it makes you happy. 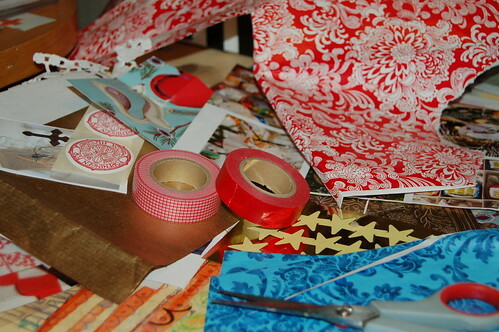 Sewing papers together and making journals makes me extremely happy. Once I got started sewing pages together on the sewing machine I couldn’t stop so it became a bulky little creature, my December Not-Daily Art Journal! Also, I have collected stickers from different shops, used postcards, some new catalogs and finally found a purpose for my red washi tape! It is all going into the new journal, though I don’t think I will fill every page this December… Like I said, I made a lot of pages! I want to sit some day soon to journal about our traditions in it, but that will only fill a few more of the empty pages. I think I will bring it out next December and continue then to add to it and be inspired by what I have already saved there. One of the things that I wanted to include in my December journal was the free printable recipe cards that I created and shared in PDF-format here on my blog earlier this month! I am very happy with them, and I have added a few of the empty ones so that I can journal on those! As you can see the from the first photo in this post the book is actually finished! I assembled it and put it together using my spiral binding machine! I will share individual pages once I take photos of them, I hope you don’t mind! I know it is officially post Christmas and all, but I haven’t had time to photograph the book yet. I will try to make better plans for next years Christmas posts… I got inspired late because I am a late bloomer… Or actually, making a December Journal was not my plan so I had to squeeze in time to make it between everything else! Though I am very happy I took the time making this book, and even started to make a second one! 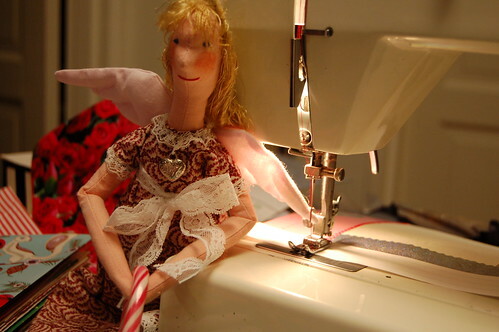 Thanks for all the lovely comments on mom’s Christmas Angels too! I got to keep one (yay!) and I am naming her Lucia St Angel! She is keeping my company as I sew Christmas pages and listen to Christmas songs and think about all the journals I want to make next year! This entry was posted in Art journaling and tagged christmas craft, december journal, on a theme, paper sewing. Bookmark the permalink. Which spiral binding machine do you use? Thanks Sophie, glad you wanna see the Christmas inspired pages even though it is after Christmas! :-) I have a heavy professional spiral binding machine, not one of the scrapbook cuties like the pink cuttlebug, hehe. Ooooh, Christmassy Journal Eye Candy. Thanks for sharing! Thanks for commenting Jennifer! :-) Hope your Christmas was good, I see you’ve made Christmassy pages too! Yay! I like the idea of making a Christmas journal to use year after year. I think it would work better than a December Daily journal, at least in my case. I look forward to seeing your completed pages. Can’t wait to see the individual pages! I almost made a Christmas Journal this year…hopefully seeing yours will give me the extra motivation I need to sit down and create. I also love that you plan to continue filling it next year! I become easily worried that I won’t “correctly” use a journal I make, so I end up not making one. Thank you for showing that it doesn’t have to be filled all at once – it can be a wonderful work-in-progress. Thanks, Hanna! 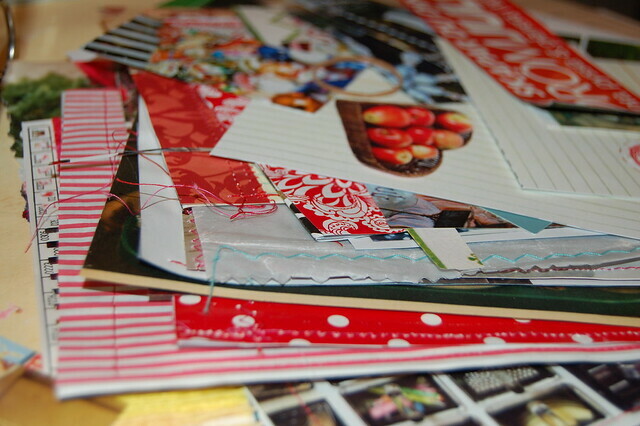 Very cool…I also started a December holiday journal and scrapbook…but totally behind as I print photos in bulk! It’s amazing how the time just flies, but I love the idea of a special journal for December…because during the holidays there’s always more to record! For months I’ve been thinking about sending you a note! Thank you for all of the ideas and art that you share with all of us who are all over the world! I, too, love your mother’s angel dolls and I’m glad that you got to keep one of them. Thanks for your sweet comment! Karyl, I’m so glad you took the time to comment, I appreciate that you let me know that you find inspiration here on my blog! Have a creative New year you too! Your book is so precious! I am dying to see your spreads! Hanna, I love your pages. You inspire time infinity! I’m not even going to tell you that next year is my real journaling year, not like 2009 and 2010, but really truly. Probably! I don’t have a binder, but one can’t wait until everything’s perfect, or until one has lots of time, as you say, one must stop just jotting notes down in address books and scribbling on loose papers, and make one’s visual journal! yes, she does! but enough blabbing for now. Hi Hanna! 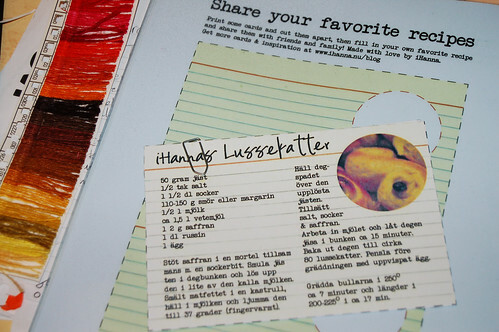 I clicked on your blog link through the Slice of Life Project on Flickr :) Love the recipe card! 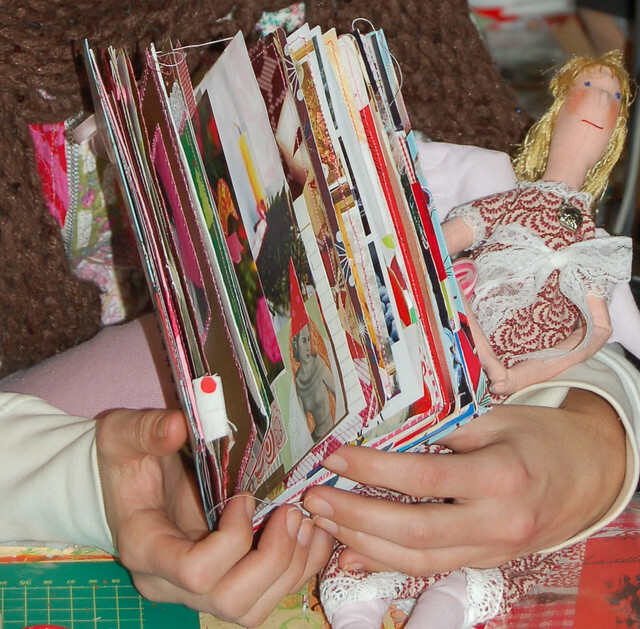 Thanks for sharing – I think it will fit in perfectly with a scrapbooking project I’ve been working on. Look forward to working with you as the class starts! Happy New Year!! !